Widely prepared for Lhosar – Tibetan New year. In addition, Tibetans often prepare them for various occasions, such as weddings, family holidays or other religious festivals, many of which are found in both Tibetan culture and the neighboring Newari. 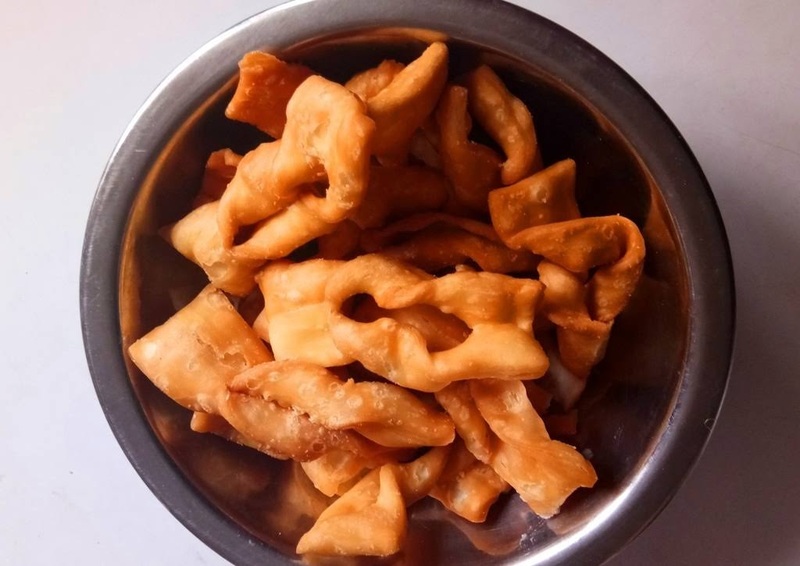 There are many different types – read: shapes – khapsey cookies. Two of them are especially popular: khapsey, commonly called an donkey’s-ear, is cut along with one cut only and turn to the other side. On the movie I maid is showed only one time of khapsey – the lesser known one. Some khapsey producers do not use milk and eggs for the dough, which others do. Salt – alternatively – who likes how. Sugar melt in cup of warm water. 1 cup of flour mix well with baking powder, then add the rest of flour. Mix together – flour, oil, water with sugar and milk. Knead to a smooth dough – about 10 minutes. Roll out the dough to not more than 1 cm thick. The next steps are shown in the movie. A long peace, 10 cm wide, 0.5 to 1 cm thick, folds in half. Then with a coordinated cut are made four notches at the bend and a fifth cut which separates a peace from the rest. The “tassels” are then separated from each other, the busquit is turned over and sticked together. Khapsey is fried in deep, well-warmed oil to golden color. After cooling down, you can store khapsey even for a few weeks in an airtight container, although of course with time will be slightly harder.